Since childhood, I was hearing from my parents about the four Dhams of Hindus and the perception for the same was Ok! I will travel to these places, once I am old. But there are some things or trips in life which are bound to happen and you can’t change them. In fact, such things and trips change your mindset and you feel why you didn’t do this earlier. Last week, my parents were here and they wanted to travel to Badrinath. And we being the quick planners; planned and packed everything in an hour and took off for another long Road trip to Badrinath Dham. Stoppages on the way: We halted at Lansdowne that covers almost 1/3rd of the total journey Or one can opt to stay at Srinagar. Best time to visit: Between May – October; as the temple is open only during this period for 6 months. Road Conditions: Excellent except 4-5 broken patches. The Badrinath Dham is located in between the folds of Garhwal hills of Uttarakhand along with the banks of river Alaknanda; at an elevation of 10,000 feet. In fact, the whole of the Badrinath town is encircled around the Badrinath or Badrinarayan temple; dedicated to Lord Vishnu. 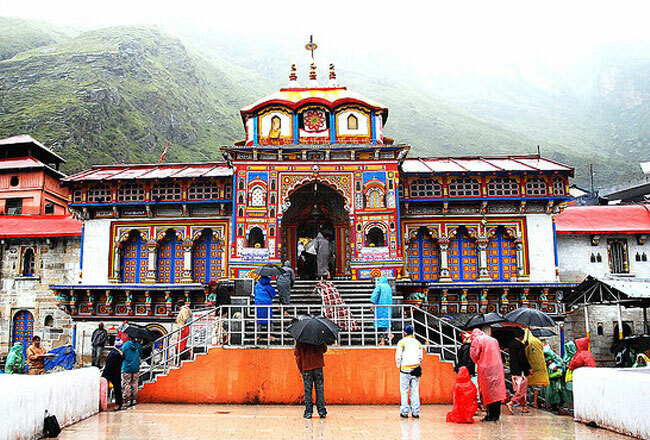 Badrinath temple is also known as Vishal Badri. The temple is believed to have Buddhist origin and later in the 8th century was converted to Hindu temple by Adi Shankara. I somehow too felt its colorful facade and architecture resembles Buddhist temple. Look at the image isn’t it resembling the Buddhist Vihara (Temple). According to the Hindu Legends, Lord Vishnu sat here in the midst of Himalayas for meditation (Mudra position); being completely unaware of the harsh weather conditions. His consort Goddess Lakshmi couldn’t stop herself seeing this and she protected him by forming Badri tree. 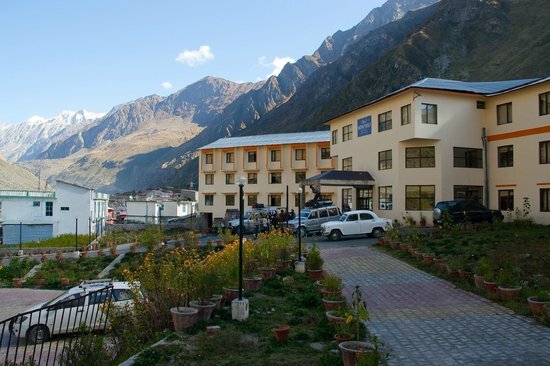 The Badrinath town used to be rich in Badri till 1979 which bear Jujube or Indian Dates. Seeing the devoutness, Lord Vishnu got pleased and named this place as Badrika Ashram. The Badrinath temple architecture and convention of bright colors completely captivated me and left me awestruck. I was literally staring at the decorations of the temple for almost half an hour; without even winking my eyes. In fact, the pristine temple enclosed between the series of Himalayas, do all justice for the long drive. One actually forgets everything and get lost in the aura of this place. The only word I could utter out was WOW!! The temple stands proudly on the plinth; between the two mountains Nar & Narayan, overlooking River Alaknanda. The arched windows and doors, facade and the intricately designed carvings around the pillars each speak for themselves. Every year almost 12 -13 Lakh pilgrims pay a visit to this temple, but still, there is calmness and serenity in the air. This place is a perfect example that how nature replenishes the valley itself during the winters. 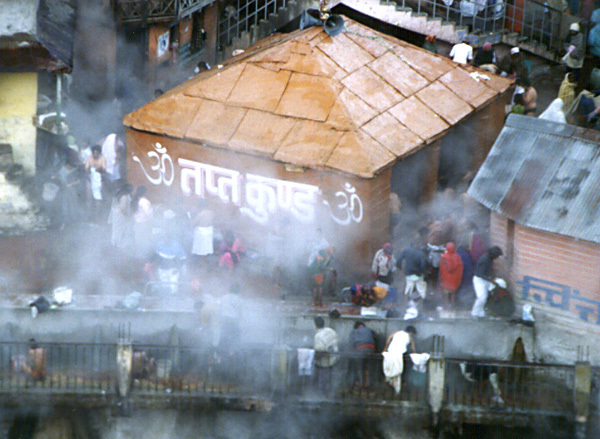 Just outside and below the temple, there is a Tapt Kund (hot water sulfur spring); separate for both men and women. The water of this Kund is believed to have medicinal properties and pilgrims prefer to take bath in it before visiting the temple. Interesting is the temperature of the spring is around 55 degree Celsius throughout the year whereas outside temperature in Badrinath is around 17-18 degree Celsius. Inside the temple, the main shrine houses 1 meter tall Black stoned image of Badri Vishal, housed in a gold canopy under the Badri tree. While circumambulation around the main shrine; we too observed certain more idols of Goddess Lakshmi, Garuda, Lord Hanuman etc. There are two more ponds in the temple known as Narad Kund and Surya Kund. 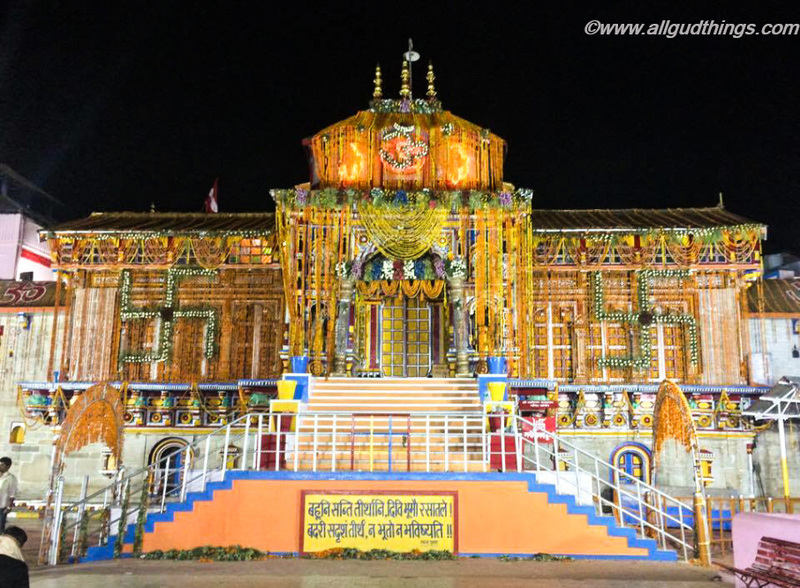 The Badrinath temple opens from 4:00 am to12 noon and 3:00 pm -10 p.m. The temple opens only for a period of 6 months, during summers and for the rest 6 months; the deity of Lord Badrinarayan is taken to Narasimha temple at Joshimath. Amazing is before closing the temple doors, priest lightens up an Akhand Jyot (Diya) filled with ghee to last for 6 months and locals told that when the door are reopened the Diya/lamp is seen flickering. Isn’t that Interesting! Photography is prohibited inside the temple, so don’t try to attempt it. There are fixed timings for opening and closing of the temple, do make a note of it for convenience. One is allowed inside the shrine only for 10-20 seconds. Avoid taking Prasad inside the temple, as half of it is thrown on the floor and it really irritates your feet while walking. And I too believe it is an insult to the Prasad and God. Always keep woolens handy with you, because the temperature here dips anytime during the day. On an average, Badrinath temple receives 8000- 10,000 pilgrims per day, so be prepared for the queue and the rush you have to face. There are more devotees on Saturdays and Sundays as compared to the weekdays. Nothing is free inside the temple. I mean for Prasad too, you need to shed some money from your pocket. Take bath inside the Tapt Kund, it really soothes out your body. Initially, I too was skeptical and felt the water smelly and never wanted to go inside the Kund for the bath. But after my mother’s decision, I felt my body was feeling relaxed. Make a visit to the temple at night after it closes down, to capture good bright shots. You will find too many Sadhus and Saints sitting on the roads. Don’t try to encounter or get into their talks with them. Bargain while buying souvenirs outside the Temple. Badrinath and Kedarnath Temple are run by the Government body and there is a special act for these temples known as Shri Badrinath and Shri Kedarnath Temple act. The head priest of the temple is a Nambudiri Brahman and he is always chosen from the Kerala state. There are strict norms for him while servicing. On an average 20 crore, rupees are donated to the temple which literally goes in the maintenance and salaries of the priests. 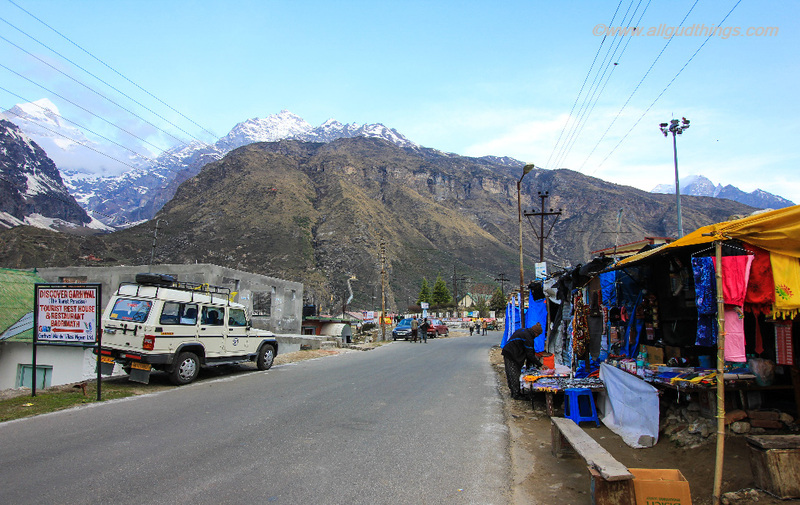 For budgeted stay, there are many Dharamshalas, guest houses, and hotels around the temple. The price for the double room with the geyser in hotel varies from Rs. 1800-2500. Whereas, for a luxurious stay; one can opt to stay at Sarovar Portico. And if you are traveling in season; prefer to get your bookings done prior hand as 10,000 is a huge no for a small town with limited options. One can find a variety of Dhabas and restaurant serving Indian food, but don’t expect the quality to be too high. So, just look for a clean place and feed yourself and do ask or check the prices before ordering. There are several private as well as government companies running Char Dham yatra service by helicopter. And the prices for each vary drastically. Here is the link for Uttaranchal Tourism. 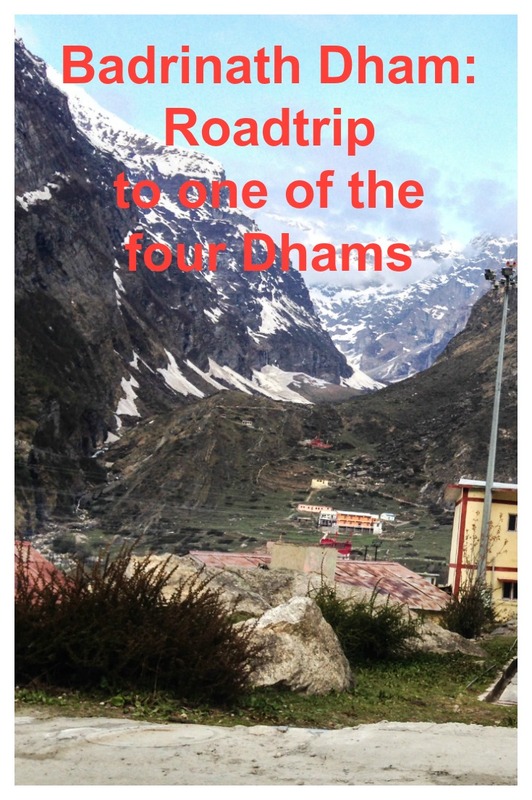 Overall, I will say the Badrinath Dham is a must visit. Don’t wait for the old age. Go, when you are young because there is so much around to explore and see. I will describe rest of all the activities in my upcoming posts. 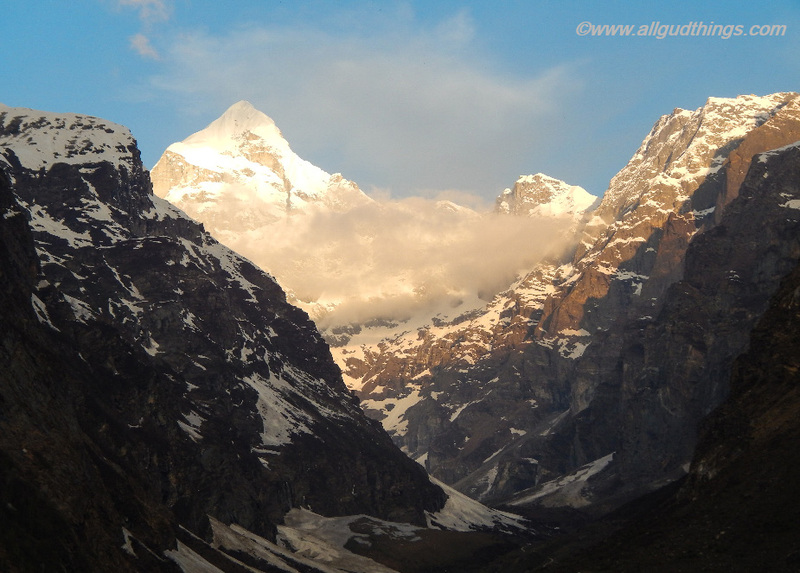 You can read about Uttarkashi: the entrance to Char Dhams of uttarakhand here. I am a sucker for bold and bright colors. I’m sure the photos of Badrinath temple didn’t do it enough justice. I need to go see for myself! Seems like such an amazing trip! The Temple is absolutely beautiful I can’t even imagine what the interior looks like. You’re so lucky to be a drive away from there. Your road trip plan sounded so interesting, I would love to see more photos from all the cities you drove through. Wow such great photos! I loved all of your tips, thanks for sharing! Loved this post! As a westerner, there were several words that you used that I wasn’t familiar with (Lakh, Prasad, and a couple more). That led to a really cool exploration on wikipedia to teach myself a few new things. Thanks for a unique cultural experience via your blog. Oh! I thought that Char Dhams is only for the old people who are going to these temples to wipe their sins! Though I love the architecture of Badrinath temple and the landscape is quite surreal! Ana even i used to feel the same but the place is actually much more than that. I have been so close to Badrinath but have skipped so far, despite traveling in this state many times! Loved your pics and the tips. Hope to check this off soon! This sounds like a great roadtrip and I love the colours of the temples. Hopefully one day I’ll get to visit. A wonderful description of a beautiful place! I remember going there a few years back and since I couldn’t see it at night, I couldn’t realize how wonderful the temple looks. Among the other religious places of worship in the state like Kedarnath temple, etc. Badrinath temple tops the list! Surichi, of late your blog posts, have been filled with some of the most amazing vistas in the Himalayas and this post is no different 🙂 I never knew the legend behind the name of Badarinath. Are there any date trees in the valley currently? No you don’t see any of them there now. Nice to see Badrinath so up and close. I found a lot of reference to it in Nepal. The Hindus there are big believers of it. Loved your pics. Holy shittttt those mountains look INSANE! You are getting me wayyyy too excited about my upcoming road trip!! Those colors on the temple are something out of a book! I would love to visit just to see those. Those mountains and temples are very photogenic. I’m sure I will enjoying snapping while exploring the place. Thanks for the tips and guides. These temples and the mountain vistas are gorgeous! I actually hadn’t heard of them before, but after seeing your photos and reading your descriptions, they are on my list to visit! These colors and pictures are amazing. Thank you for sharing this amazing road trip! This pictures look amazing.And those places look stunning that was a amazing road trip. Your dham journey is brining so much of nostalgia everytime I read a post related to it. I remember visiting this temple as a 4 year old and the pictures are still there. And I am happy that the temple still looks the same, not much has changed. I find this place mysterious with all its stunning mountain range. I haven’t heard about it yet and I’ll surely pen this on my bucket list. This is another amazing destination to include in my India’s dream place. The temples looks so lively and comforting and I would like to amble around. Thank you so much for sharing this with us. What a wonderful trip! And those are beautiful photos and I’m sure they are even more beautiful in person. I also love your detailed explanation of the history behind the details. Thank you for sharing! This is amazing, such a pious place. one of the most important places of India. The landscapes are itself so beautiful and the sanctity and serenity of the temple is reinforced by this environment. Badrinath along with the other 3 which form the 4 dhams, is a truly once in a lefetime experience. Wow, how colorful the Badrinath temple is. If I didn’t know this is in India, I would have thought this is somewhere in Latin America. I love the colors and the details of it. By the way, what is a prasad? Prasad is sweet or any edible food given to the followers in the temple, after offering to the God’s deity or saint; as a gracious gift. Oh my. I would love to go to that sulphur spring. It sounds amazing. But what got me really in awe is that temple, the colours, the texture, the architecture beauty of it and the mythology. I just love it all so much. Could you enlighten me on what a prasad is? This is the first time I’ve heard of it, and I do not want to offend if I do go there and end up taking it inside the temple or laying it on the floor. Badrinath town seems spectacular, Suruchi! Awesome post! 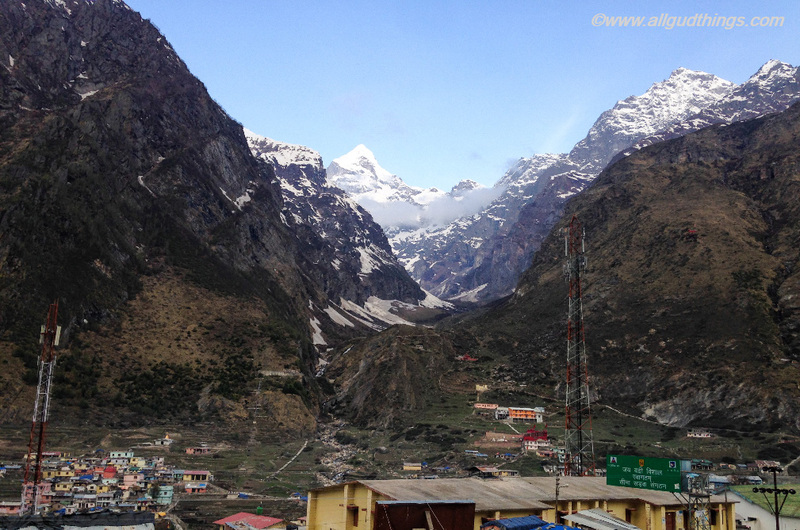 Badrinath, one of the Char Dhams is indeed an enchanting place. As they say the journey is many times more exciting than the destination. The journeys to the char dhams , probably epitomise this idea. The terrain indeed is heavenly in these parts and it is so appropriate that some of the holiest of temples are located here. Glad to see that your parents (and the both of you) finally decided to explore this part of India. It looks like a pretty long road trip, but very worth it indeed with that view! Lovely tips about visiting Badrinath Dham. Definitely looking forward to other activities that you do in the area! This looks like a great drive, such wonderful views. The Badrinath Temple looks spectacular! 55 Celsius hot spring! Wow, that’s 131 Fahrenheit, that would be way too hot for me! Another beautiful place with mountains and valley which I would love to check out in India. Would love to do the drive here but then do some hiking. Looks like my sort of place. What a great road trip! 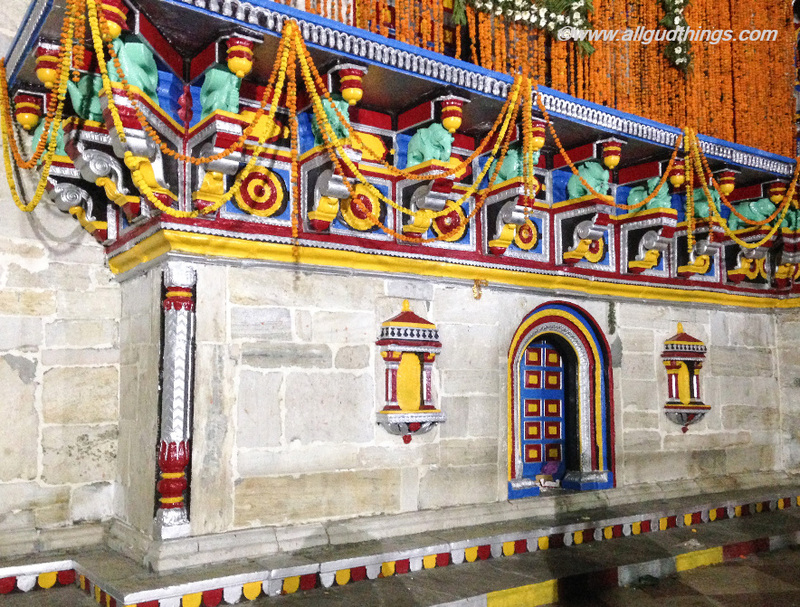 The Badrinath temple looks lovely with its bright colours. I’m sure a dip in the sulfur spring is a rejuvenating experience after that long drive. Good to know that there are places to stay which look accommodating enough. That picture of the mountain and alps . is so lovely! Photography isn’t allowed inside– I noticed that in quite a number of places in India. Again, another one of those that I would love to add to the list. More reason to come back to India! Hope to see you the next time I do. That’s interesting that the temple was Buddhist then converted to a Hindu temple, I didn’t know that happened! The view of the mountains around is absolutely incredible, there is some amazing scenery in India! I can see that this trip to the Badrinath Dham was very meaningful for you. I agree that one shouldn’t wait to make these kinds of pilgrimages. They are good for the soul, but easier to do when you are young! Great post and photos. We went to Badrinath on an Impulse. We’d just returned to Joshimath from Valley of flowers and Hemkunt sahib and on a spur of the moment decided to go to Badrinath and Mana village. I can’t ever forget that. The best part was we stayed in a guest house run by Badirnath-kedarnath-trust for just 300 or 400 per day (dont remember now). Oh interesting that you visited the dhams. I have heard a lot about them as well. Badrinath dham looks pretty interesting, such a splash of colours! I’d probably not visit any of the dhams myself, not only because I am not a religious person but because I’d probably not like the crowded places. 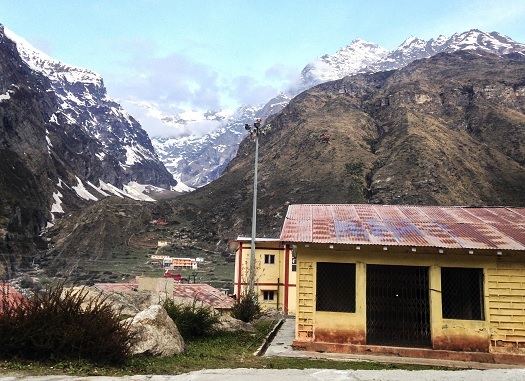 The setting of Badrinath dham does look pretty amazing though!